A Home for Refugees; Twenty-nine Families, In Fact. “The difference between a refugee and an asylum seeker is that a refugee files their application for protection abroad, and the asylum seeker files their application here in the United States. 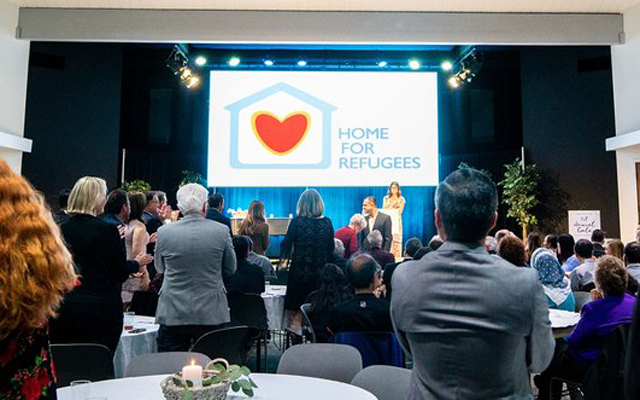 The thing refugees and asylees who have been granted protection have in common is that they have proven that they fled their homeland out of fear for their lives, and cannot return,” Minda Schweizer, Executive Director of Home for Refugees, explained. According to international law, every person who approaches a safe country’s port of entry to seek asylum, must be heard. One such port of entry is the San Ysidro Port of Entry in Tijuana, Mexico. So, how does one actually seek asylum at the border? At San Ysidro, before you reach the door of the port of entry, guards direct the asylum seekers to take a number. Numbers are called twice a day, with some days being cancelled. It can take months for your number to be called. When your number is called, you go up to the port of entry door to ask for asylum. If you are given approval for your case to be heard, you are transitioned into a detention holding facility for the duration of your asylum-seeking process. There may be a chance, if you have a sponsor to live with, to be able to go through your asylum-seeking process living in the United States of America. If a family has a sponsor within the United States and a lawyer to represent them, their chances of being granted asylum greatly increase. Al Otro Lado is a law office in Tijuana, MX that helps asylum seekers navigate the process. Al Otro Lado is a play on words meaning, To the Other Side, which is a phrase sometimes used south of the United States’ border to refer to the United States. You have probably heard news about the family separation crisis. Over the past year and a half, many asylum-seeking families from El Salvador, Honduras, and Guatemala were detained, separated from their children, and deported back to their country of origin without their children. In February, Schweizer, along with Glen Peterson, Director of World Relief Southern California, and Jose Serrano, Associate Director of Immigration and Outreach of World Relief Southern California and Executive Director of Little Brushstrokes were brought to a local motel by Al Otro Lado where they met with 29 of the families who had been deported the year before without their children. Al Otro Lado found the families after they were deported back to El Salvador, Honduras, and Guatemala, obtained visas for them to travel through Mexico, and brought them to the United States’ border to seek asylum with a lawyer (from Al Otro Lado) and, they hoped, with the help of World Relief and Home for Refugees, a sponsor family within the United States. The trio came back that day in shock, and also determined. Twenty-nine sponsors were a lot to find in a very short time. Happy to realize they were part of a larger team with Al Otro Lado, Matthew 25, Together Rising, and Families Belong Together, this Family Reunification Team set to work immediately. Sending out the call, sorting through sponsor possibilities, and finally, finding sponsors for all of the families in need. At 7am on March 5th, Al Otro Lado, Families Belong Together, and Matthew 25 brought the families to the U.S. border at Calexico Port of Entry to ask for asylum. 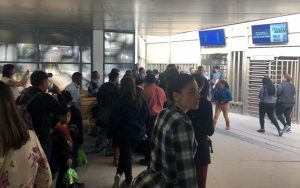 It was a very long day, but all 29 families were allowed into the United States in the evening and placed in detention to have their cases heard. Two weeks later, as of this interview, 14 of the 29 families had cleared the detention facility and are now on American soil with their sponsors, able to find and reclaim their children. Once the families are connected with their sponsors the families continue on with their asylum-seeking legal process which can last two years or more. 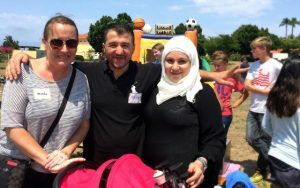 Each sponsor has the opportunity to form a volunteer team from their community, led by Home for Refugees, to walk alongside this family as they seek asylum and get reunited with their children. 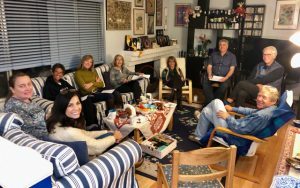 Two days before the families approached the border, Presbytery Co-Executive Tom Cramer invited Schweizer to breakfast with Susan Kreihbel of Presbytery Disaster Assistance (PDA). The meeting came at the perfect time. With 29 families waiting in Tijuana, Home for Refugees needed help to find, setup, and train 29 volunteer teams, which Home for Refugees calls Home Teams, over the next few months. 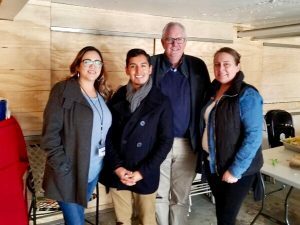 Home for Refugees, along with the Presbytery of Los Ranchos, on the suggestion of Kreihbel, requested a grant through PDA to help Home for Refugees in their current task. Executive Director Minda Schweizer with a refugee family. When Minda Schweizer graduated from Fuller Seminary in 2015, she asked herself, “What does it really look like to be a community pastor?” She looked around herself and saw great need in the refugee community. She saw how difficult it must be to come to an entirely new country, with a different culture, language, and ways of being, especially without any help. Her experience as a Campus Minister informed those thoughts knowing that students who had a community and support were more likely to succeed. Home for Refugees was founded on that idea. While it might strain one person to support a refugee family, a community has the resources necessary to help a family resettle. Home for Refugees works with communities to provide new refugees with a Home Team for their first year as they get resettled. A Home Team helps the new family navigate getting kids enrolled in school, finding services available to refugees, finding grocery stores and banks, and just learning the basics of how we function day to day in the United States. Over the past three years, Home for Refugees paired 14 families with Home Teams. There are many factors that go into developing a Home Team for a refugee family; proximity being one of the most important. Not every community can be a Home Team, but everyone can contribute to a Home Team. If you’d like to find out more about forming a Home Team, Home for Refugees, or how to support this amazing ministry, go to www.homeforrefugeesusa.org or contact Home for Refugees at [email protected]. To get updates, you can find Home for Refugees USA on Facebook and Instagram. Also on Twitter @minda_schweizer. Minda Schweizer is currently Under Care with Los Ranchos Presbytery and is a Candidate certified ready to receive a call. If you would like to donate specifically to the ReUNITE 29 Families Project, Home for Refugees has created a GoFundMe page.